1) The stores are small and manageable. It’s easy to find everything I want, and I can literally shop through the entire store in less than 30 minutes. There’s not much knick-knacks and other filler stuff like other grocery stores have. Trader Joe’s is nearly 100% food, with a few personal care products mixed in. 2) There’s a limited selection. I happen to hate making decisions between 5 or 6 different brands that are really the same product. I think it’s insane and annoying to have whole aisles of salad dressing. Trader Joe’s basically offers one option of everything they sell. After all, TJ’s stocks only about 4,000 items, compared to 50,000 at the traditional supermarket, so I don’t have to wade through everything I’m not interested in. 3) Trader Joe’s sells mostly “real” food. I’m not just talking healthy here. There are still plenty of (tasty) junk foods at Trader Joe’s. The main difference is that a lot of their products are all-natural or at least contain a reasonable number of ingredients. I hate looking at nutrition labels to find that I have no idea what 90% of the ingredients in my food are. If you don’t typically notice this, check out your cereal, bread, or snack foods next time you’re shopping and you’ll be in for a surprise. 4) It’s not overly expensive. I know that Trader Joe’s is not the cheapest option, but it does rival my regular supermarket on a lot of things. For example, I can get tempeh at Trader Joe’s for $1.69 where it costs over $3 at the other grocery store. TJ’s is definitely cheaper than Whole Foods, and it probably falls in about the middle of the cost spectrum overall. Charles Shaw wine – Also known as “Two- or Three-buck chuck.” At $3 a bottle on the East Coast, this wine is a great value with very good flavor. People tend to buy this by the case. Seaweed snacks – I’ve become addicted to these little cartons of seaweed that make a tasty and healthy snack. Paneer Tikka Masala – This is a tasty frozen dish to snag for lunch at work for only $3. 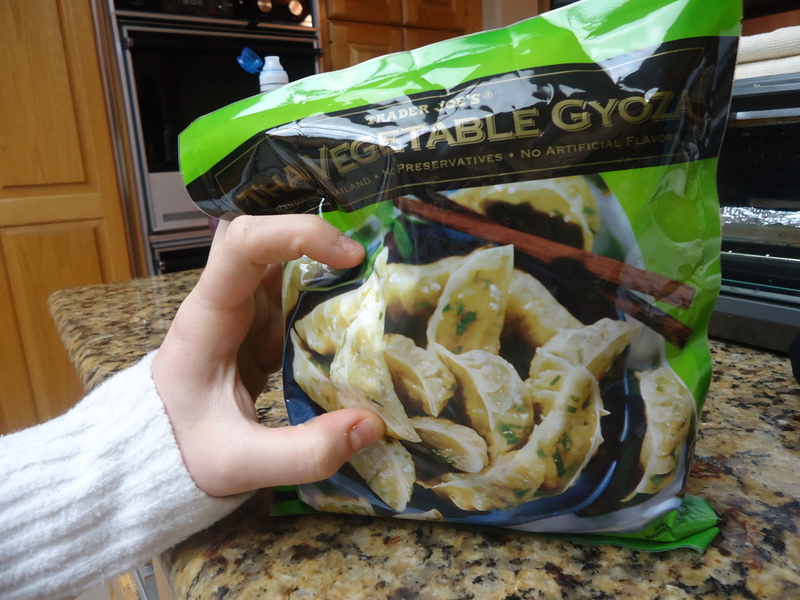 For frozen food, there’s a reasonable amount of ingredients, plus it tastes great. Gotta love the cheese! Vegetable Gyoza – these potstickers are super easy to heat up. People actually thought they were homemade before! I just steam them for 10 minutes, toss on some teriyaki sauce, and done! 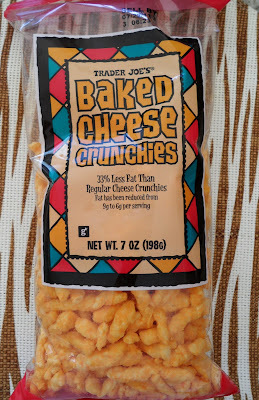 Cheese Crunchies – a lot like Cheetos, but without gross extra ingredients and with 1/3 less fat! 6) They treat their employees well. I could tell you this before even looking at the data since their workers are always friendly and seem happy to be there. I end up having a pleasant conversation with the employee ringing me out every time I’m at the store. According to Wikipedia, everyone earns “above-union wages,” and they offer healthcare to part-time employees. 7) It’s environmentally friendly. Trader Joe’s no longer sells genetically modified foods. Although there has been some controversy in the past about the fish they sell, Trader Joe’s has now pledged to only sell sustainable seafood by 2013. Apparently, I’m not alone in thinking TJ’s rocks. Trader Joe’s has a whopping 361 stores across the U.S., most of which are on or near the coasts. Trader Joe’s has the highest sales per square foot, and their sales are roughly double what Whole Foods does on a square foot basis. I will admit, Trader Joe’s does have some shortcomings. For starters, their produce is typically pretty bad. I find the quality is poor and much of the offerings aren’t as fresh as at other stores. And almost none of the fruits and vegetables they sell are locally sourced. Trader Joe’s also isn’t a one-stop shop either in terms of doing all your shopping. Since it’s more of just a food store, you won’t find many cleaners or personal care products that you’d pick up at other supermarkets. This usually isn’t a big problem for me, but every now and then I’ll have to go elsewhere to get the things I need. Ideally, I can shop at Trader Joe’s for my favorite quirky items and then pick up my produce at a farmer’s market. The source for most of this post was Wikipedia’s “Trader Joe’s” page. Check it out for even more fun info about why TJ’s is awesome. There are some strong arguments for Trader Joe’s, nicely put. We shopped there for convenience and specialty items while living in Monterey, CA. Of course the 2-buck-chuck is worth trip all on its own. Yup! They actually have a good selection of other wines that are under $5 a bottle, too, which makes me very happy. Love this post, and LOVE Trader Joe’s! I’m all for fewer choices, as it simplifies life, makes things more special, and I swear it makes you happier (why do so many people like going camping where there way fewer choices of things to do, eat, read, watch, etc.) Trader Joes does not get any environmental points in the realm of local food, but they do get some cheers for giving discounts for bringing your own bags and being entered into a raffle, for providing more natural foods as you mention, and trying to have mostly natural home and personal care products (where else can you easily find all natural bathroom spray for not too much $$? or is that just me who cares about that….) anyhoo, cheers to TJs! Haha I like the natural bathroom spray and things that like, too. I definitely think it’s a good selling point for them. If only they were anywhere near us here in the Midwest! I’ve heard only good things about TJ’s & I’d be loading up on 2/3 Buck Chuck on a regular basis. Your favorites sound great! Thanks! Thanks, Maggie! I hope they come your way someday. Maggie, they just came to Kansas City, so there’s hope for wherever you are. Ohh man, this just makes me even more jealous that we don’t have Trader Joe’s in Canada. Sigh! Our absolute favorite too! What I love about TJ’s is that you get products from all around the world and they don’t cost an arm and a leg. The people are super-friendly and they started offering paper bags before this became fashionable! Glad to hear someone else feels the same way on here! I don’t know if this is just in CA, but they don’t have plastic bags and encourage the customers to bring their own bags. Just another plus. I also agree that they really need more fruits and vegetables. I also don’t like how it’s all prepackaged so you can’t pick your own fruits/veggies. That’s a good point, Jeena. They do that with the bags here, too. But yeah, it’s a bummer that all their produce is packaged, especially if that’s the case in CA (where I suspect most of the veggies come from). Our city is regrettably Trader Joe-less. We do have plenty of Aldi markets (TJ’s parent company), but they’re a poor substitute. I suspect that even though TJ’s prices are higher on a per-unit basis, the nutritional value is also higher, therefore giving better value. Just a non-scientific opinion. And two-buck-chuck is just fine, no matter how many wine snobs turn up their noses at it.